In consideration for your dog(s) being permitted to come to our Facility “BaseCamp” or to be served by off-site Dog walking services, “Excursions”, you must agree to all the policies, procedures, release, terms and conditions set forth below. Food. Dogs will be fed in accordance with the instructions provided in the Application or instructions you later provide. While at the facility, dogs do not get fed lunch. If you want your Dog to eat lunch, you must provide the facility a container marked with your Dog(s) name and feeding instructions. 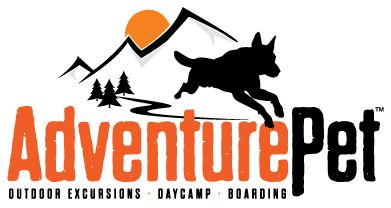 By using the services offered by Adventure Pet, you agree to allow Adventure Pet and any of their affiliates to use your Dog’s name and any image or likeness of your dog(s) taken while at BaseCamp, in any form or format, for use, at any time, in any media, marketing, advertising, illustration, trade or promotional material. This provision is binding on you, and all your successors, heirs, legal representatives and assigns. Personal Property. Adventure Pet WILL NOT BE LIABLE FOR ANY LOST, STOLEN OR DAMAGED PERSONAL PROPERTY BELONGING EITHER TO YOU OR YOUR DOG(S). IF YOUR DOG CAUSES ANY PERSONAL PROPERTY DAMAGE TO BASECAMP, THE SITE WHERE OFF SITE WALKING SERVICES ARE PROVIDED, ANOTHER DOG OR OTHERWISE, YOU WILL BE LIABLE FOR THE FULL COST OF ALL TREATMENT, REPAIRS AND REPLACEMENTS. Fees. You must pay for all services and products by credit card, or debit card. All payment is due at the time you drop of your Dog(s) or prior to picking up your Dog(s). You give your express permission for Adventure Pet to charge any credit card you provided for unpaid services or products upon the date services were supposed to have been paid for. You further agree to pay any collections costs and the cost of any returned or challenged credit or debit charges. For dogs not picked up at closing time, a late fee of $15 per dog is applied at fifteen (15) minutes past closing time. All dogs must pass an evaluation before using any Adventure Pet services which has a $25 fee per dog. Cancellation and Refund Policy. You will be charged the 50% reservation deposit if you fail to cancel a reservation for boarding forty-eight (48) hours in advance of drop off time. If your boarding reservation is within three (3) days of a nationally recognized holiday, you must cancel your reservation within fourteen days or you will be charged a no-show fee equal to two (2) nights of boarding. Holiday pricing is applied three (3) days before and three (3) days after the actual day of the recognized holiday. Holiday reservations require a three night minimum stay. Aggressive Dogs. Although Adventure Pet loves all dogs, to use our services, your dog(s) may not be aggressive and must pass Adventure Pet’s evaluation process in Adventures Pet’s sole discretion. Your dog(s) may be separated from other dogs or asked not to return if the dog(s) exhibit aggressive or other unacceptable behavior. Such determinations will be made at the sole discretion of Adventure Pet. Abandoned dogs. No dog(s) may be left at the facility after the scheduled pick up time without communication from you. If your dog(s) are left in our possession without any contact, instruction or notification regarding its pick up from you or your authorized representative, your dog(s) will be deemed “Abandoned” at 7 P.M. on the seventh (7th) day after the scheduled pick up date. If your dog(s) is Abandoned at BaseCamp, Adventure Pet will become its legal owner and guardian. Adventure Pet will, in its sole discretion, determine whether to re-home the dog or relinquish it to a shelter or rescue of Adventure Pet’s choice. YOU FULLY UNDERSTAND AND AGREE THAT IF YOU ABANDON YOUR DOG AT BASECAMP, YOU MAY BE UNABLE TO RETRIEVE POSSESSION OF YOUR DOG AND WILL HAVE NO RECOURSE AGAINST Adventure Pet. Duty to Disclose. You must disclose on a continuing basis, any and all medical or other conditions, including but not limited to personality concerns or behavioral incidents that in Adventure Pet’s sole discretion, may affect, limit or prevent your Dog(s) ability to participate in any of our services.